FOR IMMEDIATE RELEASE TORONTO, ON (September 10, 2015)—When it comes to holistic health, Dr. Nekessa Remy is the whole package. She is a chiropractor, an acupuncturist, fitness trainer, and health advocate. In her practice, Dr. Remy specializes in injury management through chiropractic rehabilitation but her real purpose is to ensure that a healthy lifestyle can be attainable to anybody who wants it. FOR IMMEDIATE RELEASE TORONTO, ON (June 8, 2015)—Dr. 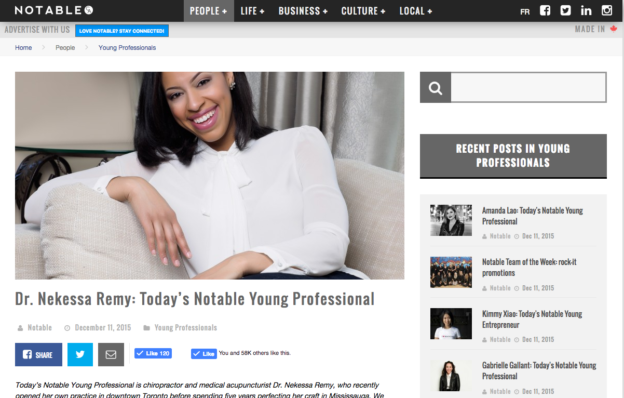 Nekessa Remy, a licensed chiropractor and budding brand in the lifestyle arena with a focus on health and wellness, has been selected as a National Role Model by The Black Canadian Awards. FOR IMMEDIATE RELEASE MISSISSAUGA, ON (May 23, 2015)—It’s the season for going outdoors and getting a good run in, but runners beware of injuries that can occur from your routine run.